Take a vessel and boil milk. Add cooked rice, sugar and let it cook for around 15-20 minutes on a medium flame. Stir it occasionally. Blend it slightly with a blender so that rice is mixed properly with milk and have a thick consistency. Add elaichi powder and cook for 5 more minutes. 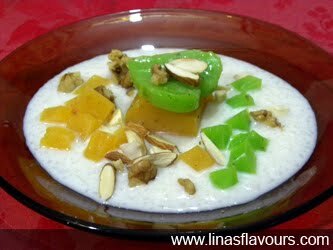 Take a bowl and mix tapkir, water, vanilla essence and food colour properly so that there are no lumps in it. Take a dish, grease it with ghee. Keep it ready. Take a kadai(wok) and heat ghee. Pour the mixture into ghee and stir it continuously to avoid lumps. Stir it till ghee leaves the sides. It shows that your halwa is ready. Pour halwa in the greased dish and spread it evenly. Garnish it with elaichi powder and let it cool. Add ½ cup water to carrots and boil it. Let it cool slightly. Blend it to make puree. Take a bowl and mix arrowroot flour, water (total 1 ½ cups including carrot puree), vanilla essence and properly so that there are no lumps in it. Pour halwa in the greased dish and spread it evenly. Garnish it with cardamom powder and let it cool. Add both the cubes and nuts in the kheer. Serve it. Note: You can use jelly cubes also instead of tapkir halwa. You can add your choice of nuts.